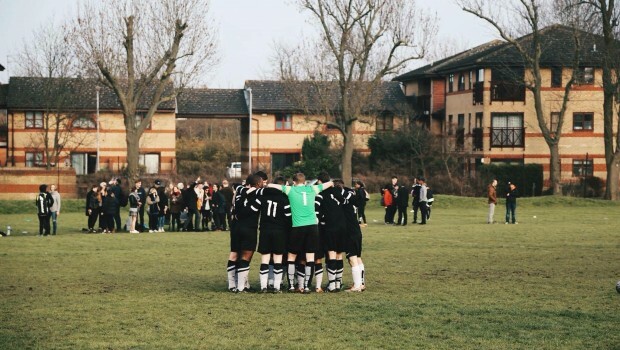 Unlike in the US, college sport here in the UK is low-profile not seen as a big deal – unless you actually play it. Due to committing myself to a football team outside of UAL for the first two years of my degree, I’d never had the opportunity to represent the university until this year when I decided to take a break from weekend and midweek games. 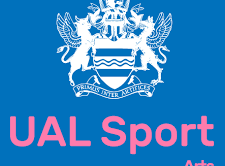 So whenever I’d previously heard excited talk of ‘Varsity’, I was pretty sceptical about its hallowed status on the UAL sporting calendar. 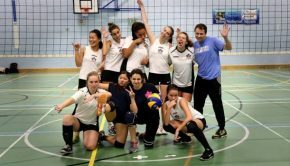 For those not in the know, Varsity is the day when UAL teams go toe-to-toe with local rivals Goldsmiths and compete in a range of sports from football to ultimate Frisbee to cheerleading to determine this year’s champion. As it drew closer, all the chatter was about the importance of not losing to our south London rivals and winning bragging rights for the next 12 months. If I’m being brutally honest, I was struggling to buy into the intensive hype leading up to the ‘Big V’ – after all, it’s only a game of football at university (although I wouldn’t dare of said that to anyone involved leading up it). Come the big day, and the first thing that struck me was the atmosphere of camaraderie between all the UAL football teams. All three men’s sides met at 9am for breakfast together, a fitting way to build up to the big occasion. There was no divide between them, a friendly and positive environment to set the tone for the rest of the day. The Men’s 3rds kicked off at 10.30am, meaning everyone else had to go and support them. My first thought was ‘that means I’ll be there five hours before we kick off’, but it didn’t take me long to buy into what this was all about. It’s more than just your one game, it’s the occasion, so regardless of whether you’re playing in the morning or afternoon everyone is expected to get behind each team. It didn’t take long for the netball teams, cheerleaders, rugby all to join the party either which made it even more evident that it’s about more than just playing your sport. 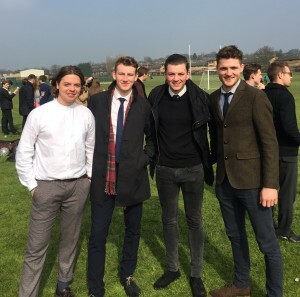 I was looking at it from an outsider’s point of view as I only knew people from my team, so seeing everyone embrace the occasion was something special and a testament to everyone who puts in work behind the scenes of the university’s sports clubs. It seemed like a tight-knit family throughout the day which is something that will stay with me. At the start of the week, I was thinking ‘it’s only a game’. Don’t get me wrong, I wanted to win, i just didn’t grasp how important it is to some people. I certainly did after just half hour – you only have to see the reaction to a goal. UAL Men’s 3rds gave Goldsmith’s a 7-2 drubbing although the celebrations from players and spectators didn’t change once from the first goal to the seventh. It was at that moment I realised how big Varsity is. If the 3rds victory was an eye-opener, the 2nds’ shoot-out defeat was another. After UAL had taking the lead midway through the second half thanks to a fantastic solo effort from Nan Xie, Goldsmiths scored late on to take the game to a penalties where they prevailed. Cue glum faces of disappointment. Our game was the last of an intense Varsity programme, and due to events that happened earlier it was the decider as to who won Varsity 2016. As kick-off got closer, the tension increased. If someone said to me as I left my house that morning I would get nerves prior to kick-off, I wouldn’t have believed them. But after witnessing a day of ups and downs it certainly got to me and now I realised why everyone was so fired up by the occasion. A soggy pitch with one end a mud bath near the penalty area had certainly suffered after three hard-fought matches. We found ourselves 2-0 down after 20 minutes, and despite knocking on the door on a number of occasions with Kovi Konowiecki and Will Mowbray strikes, a determined Goldsmiths back line couldn’t be breached, meaning they won the game and more importantly won Varsity 2016. It surprised me that I was genuinely gutted about losing. However it made me realise I’d embraced Varsity: going to the breakfast, dressing up smart, supporting each side that’s playing, socialising with other members of the university, all the finer details that make it what it is. On reflection, it made me wonder why I didn’t pursue playing for the university from the start. Yes, I had other commitments, but I don’t think I enjoyed them half as much as I did turning out for UAL. Playing with this group has restored my appetite for the game. To come off at full-time with people praising your performance despite our losing effort was a highlight of my university days that I won’t forget.